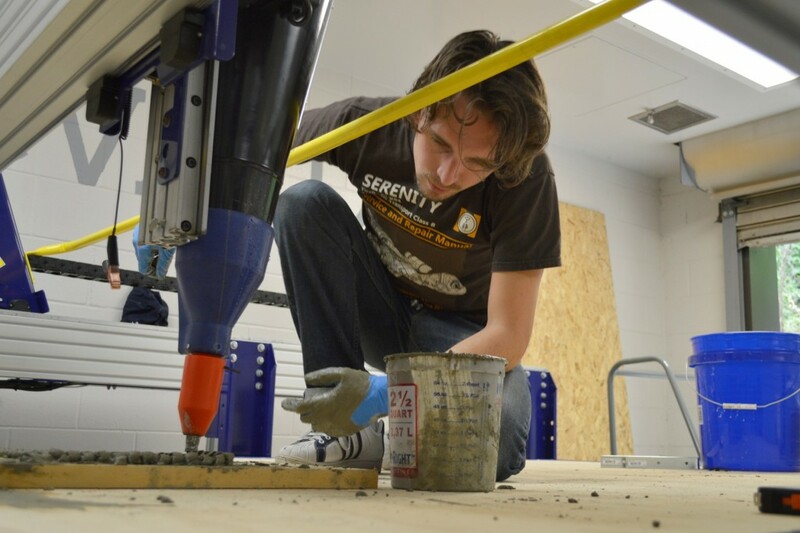 MMAP Project Leader, Windham Graves, creates large 3D print with concrete. MMAP Project Leader, Windham Graves, began the MMAP (Multi Modal Additive Printer) project in the summer of 2012. Funded through the Florida State University Research Foundation (FSURF), MMAP is a 3D printing platform for use in materials research, experimental form generation and human-scale art making with an 8x6x4 foot print envelope. To date, he has experimented with ABS plastic, wax, high-density polyethylene and a variety of concrete and aggregate mixtures. Recently, Graves retrofitted the MMAP printer with a specialized extruder designed to handle concrete and ceramic materials. His next series of tests will focus on printing with ceramic, generating large-scale prints for kiln firing. FSU MFA graduate and Instructor at Valdosta State University, Mark Stafford, provided assistance with the project, lending his expertise with ceramic materials. Form Lab Project Fellow, Michael Rees, utilized MMAP earlier this year and FAR staff looks forward to inviting more researchers to the facility to experiment with this unique piece of equipment. For more information on this project or others like it, visit the Facility for Arts Research website.